Sharp’s range of BIG PAD interactive screens are deigned to provide smooth and effortless communication in a wide range of contexts. 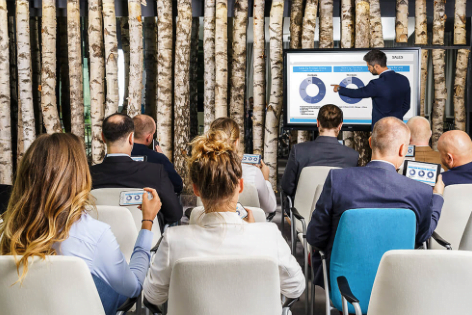 From meeting rooms and board rooms through to classrooms and training centres, the Sharp BIG PAD range of products change the way you communicate. There are 10 BIG PAD devices in Sharp’s range of interactive displays ranging from a modest 40” right through to 80”. Four are specifically designed for the education market, with six aimed at businesses. 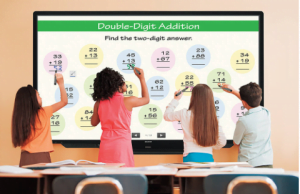 The PN-60SC5, PN-65SC1, PN-70SC5 and PN-80SC5 are 60”, 65”, 70” and 80” interactive touch screen devices, developed to meet the bespoke needs of the classroom. These BIG PADs are the ideal device for ultimate collaboration, allowing up to 4 students to work together on tasks. Sharp has a range of 6 interactive displays designed to meet the needs of busy office spaces, ranging from 40” up to 80” in dimension. Recognising up-to 10 points of contact, the Sharp BIG PAD devices enable up to 4 people to write on the surface of the screen at the same time using either their fingers or a Sharp Touch Pen. The simultaneous touch ability allows participants to take an active role in meetings, lessons and brain-storming sessions. Discussions become engaging and meetings become open platforms for interaction. Sharp BIG PADs have their own pen software, simply called Sharp Pen Software, which allows users to write on the board just like they were writing on a piece of paper. Each pen comes with its own software, providing easy access to pen settings and functions. Even when all 4 users are collaborating, they each have their own menu to change colour and line thickness, to ensure that their individual annotations and ideas are clear. The pen is so smooth, it is just like writing on paper. There is a pressure sensor at the tip of the pen, so the harder you press, the thicker the line produced. The Infra-Red technology behind the board also enables effortless, uninterrupted flow, with no need for the dreaded calibration. The BIG PAD has handwriting recognition, so when users write quick annotations on the board, it can be converted into OCR text, making legible and accurate minutes for any meeting. The Sharp BIG PAD has two front mounted speakers, at 10W each. The speakers are mounted to the front of the screen delivering clear sound in even the biggest meeting rooms. Using Sharp Integrated Office, documents and images scanned from a colour Sharp MFP can be imported directly to the BIG PAD, so documents that are not saved on the network can be annotated in a meeting, quickly and efficiently. Additionally, any annotations or notes created on the board can be printed directly to an MPF or saved directly to a PC. Up to 50 devices can be connected wirelessly to the Sharp BIG PAD. This allows the sharing of onscreen content, the transferring of files, interactive onscreen writing and drawing, as well as the remote control of the BIG PAD from a mobile device. Users are able to capture onscreen images and save them on their mobile devices, to make individual annotated memos. Additionally, up to 3 BIG PAD devices can be connected via Sharp Display Connect, creating an extra-long interactive screen ideal for lecture theatres and large training centres.